Please note, pricing is accurate as of 9/1/17. Pricing and availability are subject to change at any time after quote. ​Thank you for giving me a call this afternoon and I would love to help you with your Anniversary Cruise vacation. 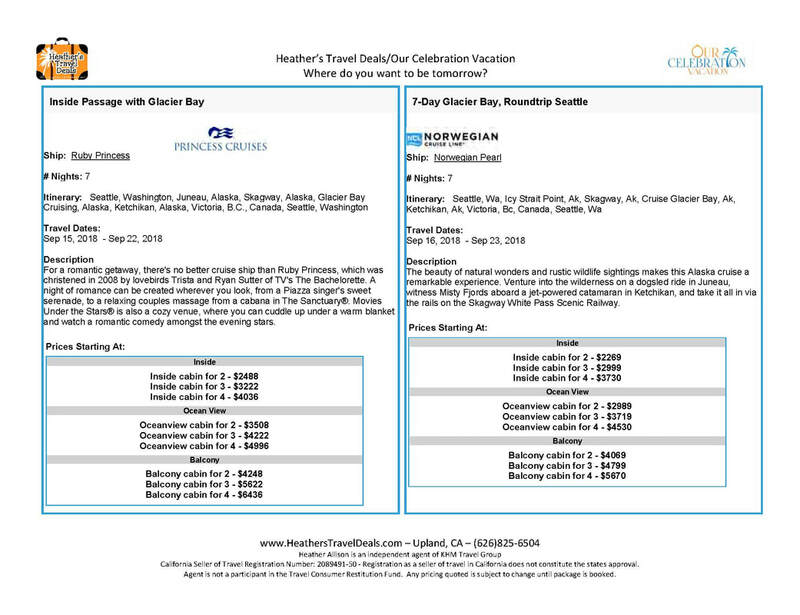 I am attaching two cruises that I'd like you to look at. The pricing is the total price for the entire cabin (not per person) and does include taxes and port fees. The pricing doesn't include the suggested gratuities of $13 per person, per night, that will be charged when you are onboard. It also does not include airfare as the rates for air won't be out until November for flights in September. For the two cruise lines, Princess is more upscale than Norwegian. Princess does contract with the Discovery channel for their Alaska cruises and there will be talks onboard about Alaska from naturists. Norwegian does have a promotion right now, where for inside cabins you get to choose one "free" promotion, and for Oceanview and Balcony cabins you get to choose two "free". I put free in quotes because if you choose the Ultimate Beverage or Ultimate Dining packages, they do add the gratuities to your total which increases the cost.